“A good butcher is important to have. It’s like a shrink.” – Carson Daly. 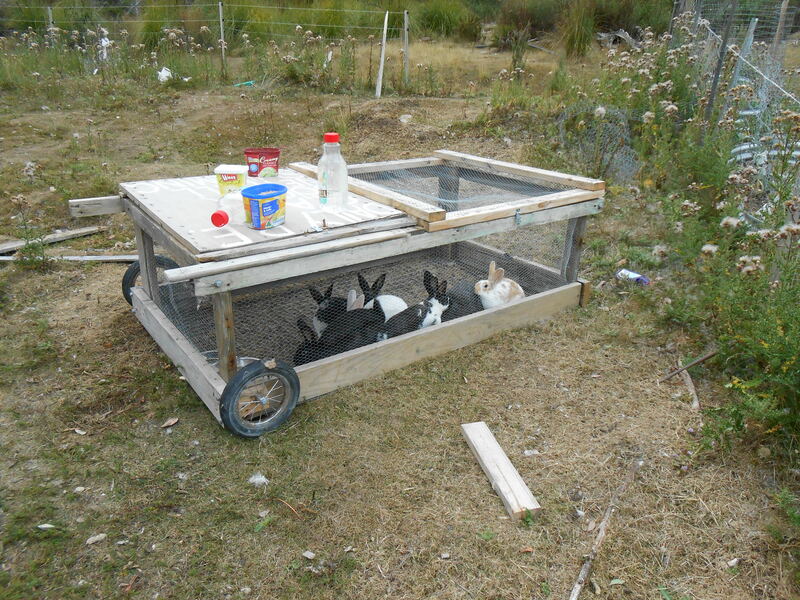 The reason they asked was because I mentioned that this weekend I would be processing 7 rabbits that I had grown. They felt that as I had grown these rabbits from babies to adult should mean that I felt some connection to these animals. They were not wrong in their thinking. Although I had not named these animals because it would make it harder to butcher them, I still feel a connection to them. I was there the day they were born and I had cared for them. I had sat and patted them and played with them. When I process these animals I feel a little sad for their having to die for my family’s meal, yet I know that were it not for the fact that they would eventually become food, they would not have existed. I would not have allowed their parents to breed were it not for the intended purpose of producing rabbit meat. I also feel that these animals have a much better life than a wild or factory rabbit would experience. They are allowed to live in close proximity to their mother till they are weened. They live in a pen with their brothers and sisters. They live on grass and other fresh plants. In short, they have a great life until the day they are to be processed into meat. At this time I attempt to slaughter them as humanely as possible. I do not want the animal to suffer. I remember the first time I killed an animal. It was a pig that I was going to eat and I felt terrible for doing it. I had actually When I ate the meat it tasted terrible to me, yet everyone else thought it was delicious. All I could smell was the pig, not the cooked pork. All I could taste was dirt, not the delicious meat. For a long time, every time I did the action of slaughtering and butchering the animal, the taste was always terrible to me. I believe that this was due to the gilt of killing an animal. I have now gotten over this and I can enjoy the meat I prepare for the table. I think it is important to not lose this connection to the animal and to always feel some regret when I kill for meat. By feeling this I ensure I retain my humanity and respect for the animal. The rabbits during happier days… when they were alive. One of the benefits of producing my own meat is that I know the quality of the product and I know that nothing has been added to the end product. I know that my family is eating good food. Another benefit is that my children are more likely to finish their meals. My kids know where the meat comes from and sometimes they even watch me butcher the meat. I explain to my children that an animal died for their meal, so they need to be respectful of that and finish everything. Finally, my children are very interested in anatomy. By showing them the different parts of the animals they gain a better understanding of the functions of the body. Sorry for the graphic image – One of the rabbits’ heads was removed before this image was taken in the process of preparing for butchering. Today I completed the first of my 13 skills for 2013. I achieved my target of butchering 7 rabbits in 90 minutes using the techniques I picked up on the YouTube video I referenced in an earlier post. It was pretty exhausting, yet satisfying to reach my target. My youngest son wanted to come and say goodbye to the rabbits and I decided that it might be good for him. He told me he was a bit sad that the rabbits had to die and I explained to him that the rabbits have had a good life. I told him that the rabbits are for meat. He understood that and asked to say goodbye to each rabbit. So as I picked each rabbit from the pen and walked to the area for their slaughter, my son gave them all a hug and a kiss on the head. It was very touching and it shows me how sensitive nature of my son. 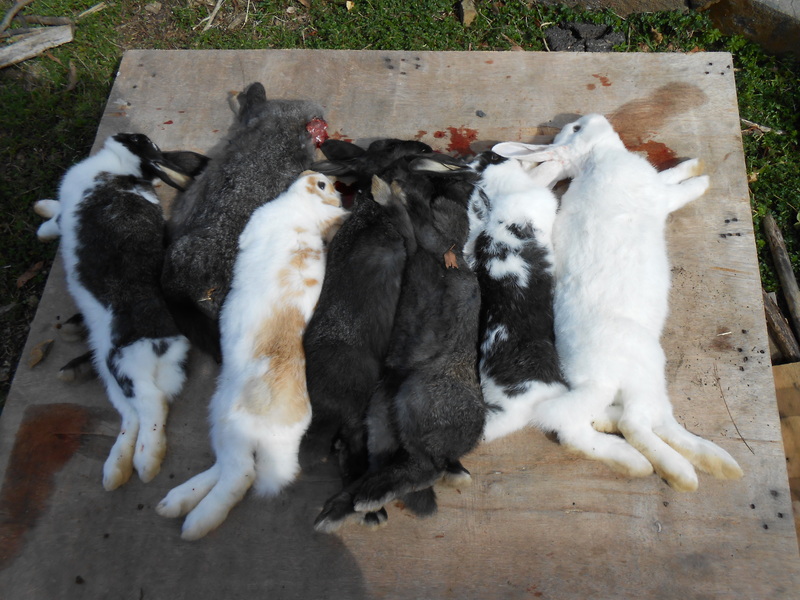 I decided to shoot each rabbit with a hollow-point .22 to ensure they died instantly and did not suffer. This decision was made partly due to the fact that I had seven rabbits to work through and the rifle was an easier way to do it than breaking seven necks. First rabbit of the rank. This image shows the mostly skinned rabbit and what I have to work on. You can also see my excellent Star Trek mug in the background. I processed the rabbits and ended up with just over 4 kilograms of rabbit meat. Not a bad collection. I also now have 10 rabbit skins in my freezer. They will wait there till I have the time and knowledge on tanning these skins. 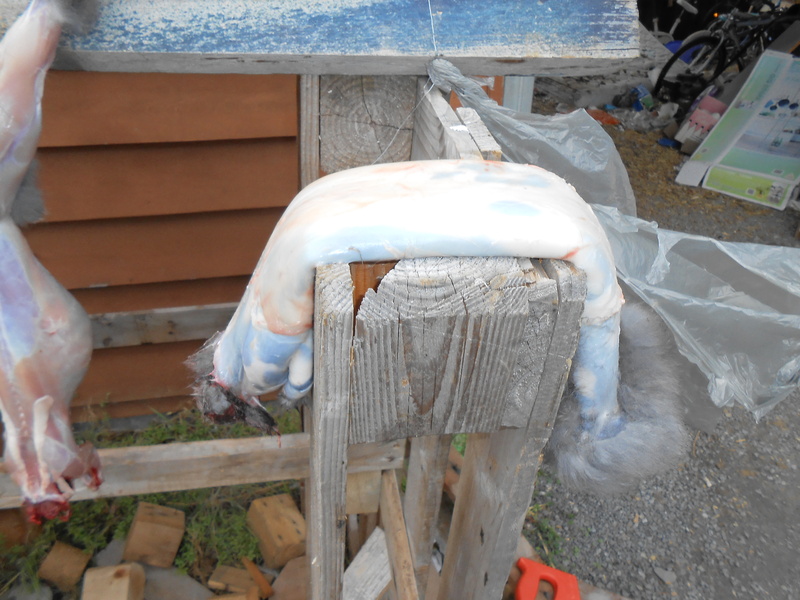 This is the inside out rabbit skin. I stored this in a plastic bag with my other skins. Turned out to be a busy day. 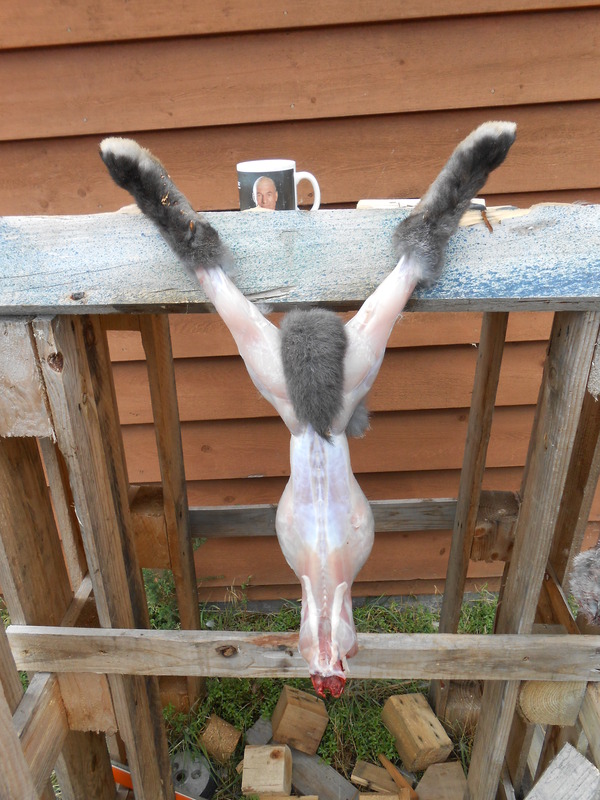 After the butchering I had to clean the tools, clean, weigh and package the rabbit meat, and finally sit down for a rest.